The first of the kale was harvested on Sunday. This was a momentous occasion because we’ve only attempted growing kale once before, about three years ago in our back garden, and it failed. Despite its promising start, it was suddenly thwarted by a nasty case of mildew which rendered the entire crop useless. Since then, Kale has always been a bit of a sore point for us. The one vegetable that defeated us. (We didn’t like to talk about it). So, when this year’s crop arrived hearty and healthy (despite an earlier ravaging by slugs from which we were certain it would never recover), we were thrilled! I’ve only ever steamed or boiled kale previously, eaten it as an accompaniment to something else. But with this, our first home-grown crop, I wanted to put the kale centre stage; make the kale the star of the show. 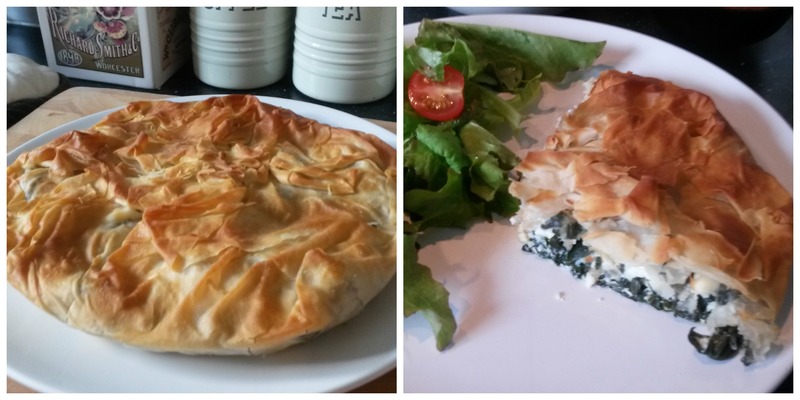 I began thinking about spanakopita, a delicious pie made of spinach and feta cheese that I’ve previously enjoyed on my travels in Greece and I decided to attempt my own version of this – with kale! This was rather foolhardy of me because I’ve never made spanakopita before, I’ve never used filo pastry before, and I was making the whole thing up as I went along (jotting down my recipe as I did so), but I have to say, the end result was actually quite delicious! So here we are my friends, allow me to present to you my bastardization of the Greek classic spanakopita! Fry the garlic and pine nuts in a little olive oil until they begin to colour, before putting them in a large bowl. 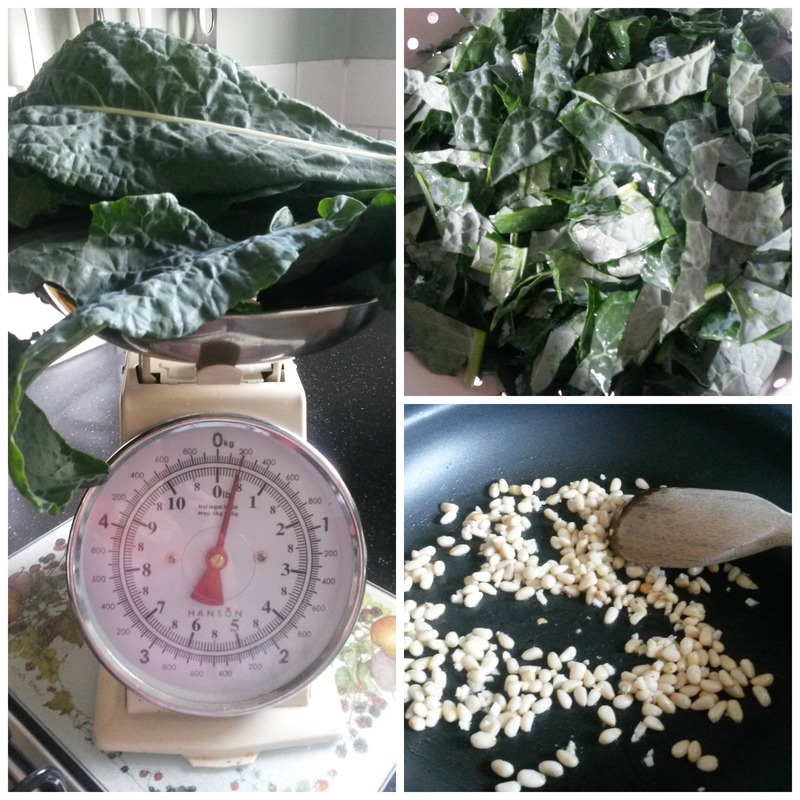 Wash and shred the kale leaves (removing any extra-thick pieces of stalk) and place them in a large saucepan with a couple of tbsp. of water. Cook until wilted. Drain and allow to cool. Beat the eggs together before pouring them into the bowl with the garlic and pine nuts. Squeeze out any excess water from the kale before adding to the bowl. Crumble the feta into the bowl and give everything a good stir. Add plenty of black pepper. Take the first sheet of filo pastry and brush it with some olive oil before draping it, oil-side down into a pie dish (I used a 26 cm shallow pie dish) so the edges of the pastry hang over the side. Repeat with the next sheet, rotating it slightly so the corners are further round the dish. Repeat with the final sheet. Spoon the spinach and feta mix into the pie-dish, before gathering the corners of the filo pastry into the centre to cover the filling, scrunching it together. Served with a mixed salad, this is a perfectly light, summer evening’s supper.